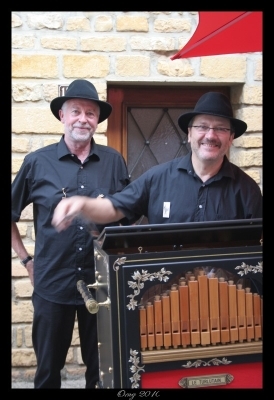 Our Company “Le Turlutain” has been created in 1992 by Gérard Dabonot (on the right of the photograph) and Ludwig Rodehüser, both very active in the field of mechanical music for many years, with the aim to promote the edition of mechanical music. We are specialized in the production of punched paper-rolls for barrel-organs and cardboard-strips for programmable music-boxes that are also available in our internet-shop. You will find on our website as well a large choice of barrel-organs of different origins; we are re-sellers in France for German (Raffin), Belgian (Pauliphonic), and Austrian (Wittmann) instruments. For some of these models, adaptations to special musical tastes or the needs of singers and organ-grinders can be made upon request. Our company is located in Lorraine, about halfway between Nancy and Lunéville. If you want to visit us please contact us before by phone (we will answer in English) or e-mail for an appointment.